Lady Liberty stands in the center of this painting; behind her is a backdrop of a cool colored sky. At her bottom right there is a bust of George Washington engraved with a quote by Henry Lee III at Washington’s funeral, “First in War, First in Peace, First in the Hearts of his COUNTRYMEN.” Around the window shade are symbols of American pride including the American flag, an eagle, a liberty tree, pole, and cap, which is also referred to as a Phrygian cap, as well as the crown of the British Monarch (then George III) being crushed. Found in a common tavern, Lady Liberty and Washington window shade’s message surrounded the newly American people. It was created by an untrained artist whose only goal was to encourage a sense of patriotism for ordinary Americans. This window shade was created between 1800 and 1810, the very years that led to the War of 1812. During that time, turmoil was rising to new heights between the United States and Great Britain, the two countries represented in this artwork. Britain felt the need to retaliate against the Americans after they were stripped of their title as having the strongest naval power in the world. The men that populated America in the decade between 1800 and 1810 were the sons of the men that fought in the Revolution—they were eager for war and the stories it would provide for sons of their own. 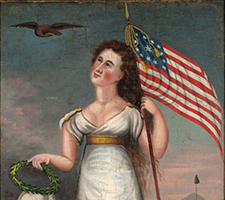 This work depicts the patriotic feelings of the first generation of Americans and their plans for the future. Every symbol individually represented on this window shade gives insight to what life was like in the early 1800s. The most important symbol is Lady Liberty, as she is at the center of this painting. Lady Liberty, who evolved from the Roman Goddess of Freedom Libertas, was seen as symbol of strength and American independence. When she was adopted by the Americans in the 1760s, she was never seen without a Liberty Tree, Pole, and Cap—all objects found to Lady Liberty’s left. Below her is a crown with rich embroidery, suggesting the crown of a monarch. This crown is indeed that of the infamous King George III. Lady Liberty’s action of stepping on his Majesty’s crown displays the anger of the American people. The presence of George Washington’s bust is not by happenstance, and neither is the quote underneath it. Any person who commonly had busts made to commemorate him or her is a person who was well respected. Though a presidency will not last forever, sculptures praising the president will last for many years to come, enforcing the legacy of the former leader. The bust’s appearance in the painting implies that Americans had few bad things to say about Washington during his time as president and the years following. The quote was taken from Washington’s eulogy and expressed the universal appreciation Americans had for him. 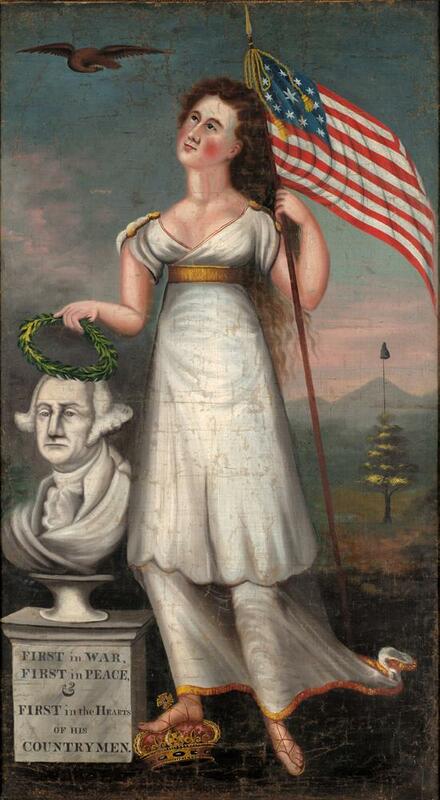 It also shows that this piece was illustrated after 1799, the year of Washington’s death. Lady Liberty, a widely represented historic figure, holds the American flag while looking at an eagle for guidance and being accompanied by the first president. The combination of American legends conveys a significant amount information regarding the level of patriotism during the time period in which it was made. Symbolism continues to play an important role in our society, and it has the capability to sway one’s opinion. Symbolism surrounds the foundation of marketing and politics. Politicians explicitly used symbolism and stereotypes to obtain votes from the American citizens. Symbolism is often not transparent: it is not easily identified but still influences us subconsciously. If one were asked what some symbols of strength were, what would you say? Perhaps muscle, youth, and possibly even height. On the other side of the spectrum, if an elderly man in a wheelchair were to approach you, you may not perceive him as strong because you may not feel physically threatened. Washington and Lincoln, two of our most memorable presidents, physically towered over civilians, as did many past presidents, especially those with a history in the military. But one president, though physically tall at 6 feet 2 inches, was perceived in a different way: Franklin D. Roosevelt. As we know now, Roosevelt utilized a wheelchair after he developed polio and was not able to stand up on his own. As Roosevelt campaigned for presidency, he hid this truth because he knew it would make American voters perceive him as weak. “He lived in a different time, when people thought being disabled was being unable,” said former President Bill Clinton. Roosevelt was instructed to avoid the press in fear they would expose his disability by taking photos of him, and when a few pictures emerged showing Roosevelt in a wheelchair, his staff members were displeased. Through all of his campaigns, Roosevelt would give speeches while clutching the arms of his sons, and the only photos that were taken of him were from the waist up. This is evident in the campaign button manufactured by the Roosevelt campaign staff. On the button is a photograph of Roosevelt, in blue—intentionally patriotic as blue is one of the three colors of the American flag. 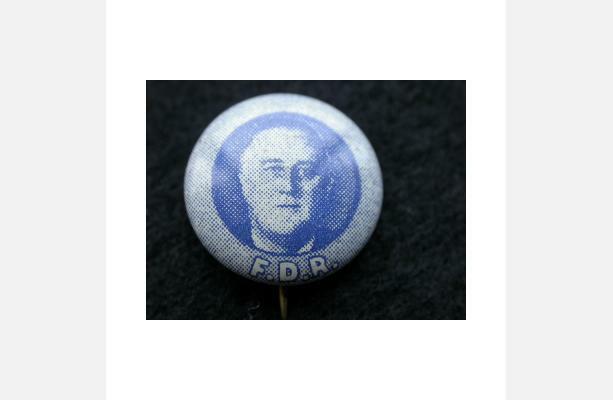 On this campaign pin, the bust of a president is a symbol of respect, similar to Washington’s bust in Lady Liberty and Washington window shade. Seventy-five years later, we know that Roosevelt was a great leader of this nation and that his disability did not prohibit him from being a great commander-in-chief. The lesson presented is not only that people with disabilities are much stronger than they may physically present, but also that symbolism has a much stronger presence than one might have realized. The symbolism in Lady Liberty and Washington window shade may project a positive message that greatly influenced many Americans. The subconscious effects of symbolism are powerful, and we experience reminders of them every day through objects as uncommon as window shades or as prevalent as the media.